The Valley of the Moon Main Stem Photo Archive: COMING SOON to a library near you. 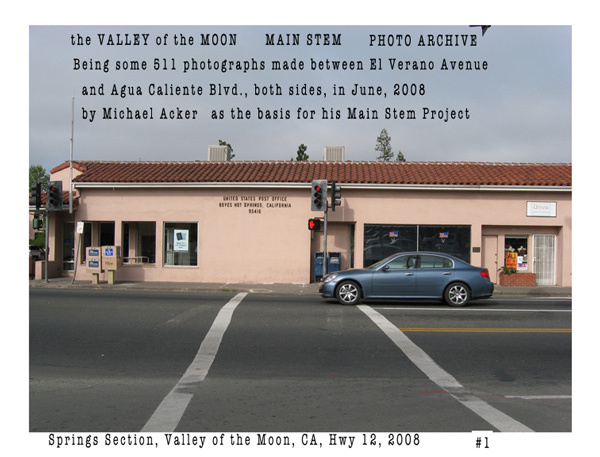 In 2008 I started my Valley of the Moon Main Stem Project by photographing all the buildings on Highway 12 between Verano Avenue and Agua Caliente Blvd in the Springs section of the Valley of the Moon. I intended to combine my photos with historic ones of the area in order to revivify the history of the area. Alas, the photo record of the highway is far from complete. I came to wish that someone had left me a record such as the one I had recorded. Therefore, I became determined to leave my photographs for future generations of artists, historians, planners, and the curious, so they might have a more or less complete record of what the street looked like at an instant in 2008 (with some updates). My photographs are digital. At first I was content with the thought that a disk, a thumb drive, or a cloud storage account would be a good way to preserve the collection. A little reading and thinking made it clear that this was not so. Technology changes too fast. The longevity of physical storage media like disks is unknown. Storage on paper is still the surest way to preserve documents, especially images, for 100 years or so, for the obvious reason that no technology is required to read them. 100 years is a pitifully short period of time, but think of the changes that have occurred in Sonoma Valley since 1915; or 1925; or even 1935. The main body of the archive contains around 600 photographs. I intend to print them with a laser printer or inkjet on acid free paper, which may, or may not produce prints that last 100 years. I will not bind them but put them in a box. They will be numbered. I will produce two copies of this collection. One will go to the Sonoma County Library and one to the Depot Park Museum.